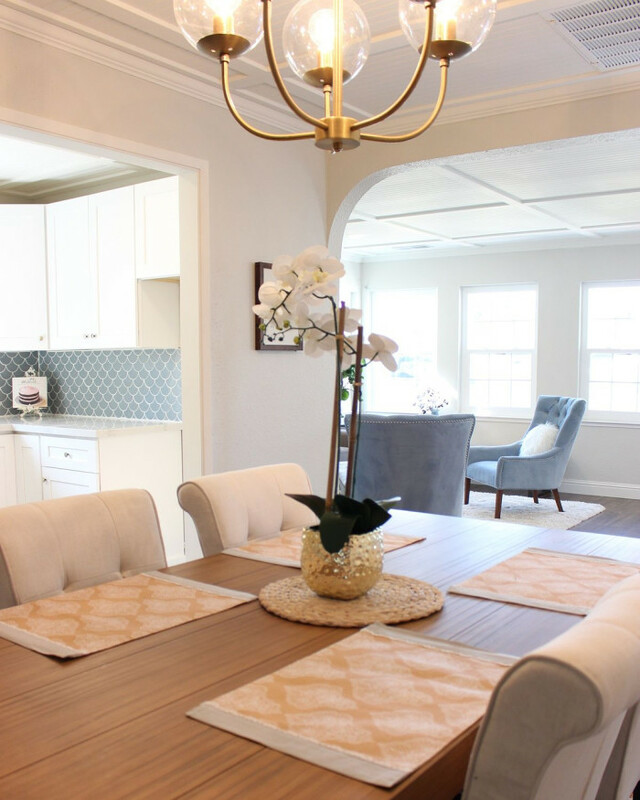 Choosing to remodel your home, or just parts of it, can seem like a daunting endeavor. How much will it cost? Who's going to do the work? Do I remodel or just move? Where do I even start?!? Whether you’re planning a whole-house makeover or remodeling a single room, here are some ideas to get you started. 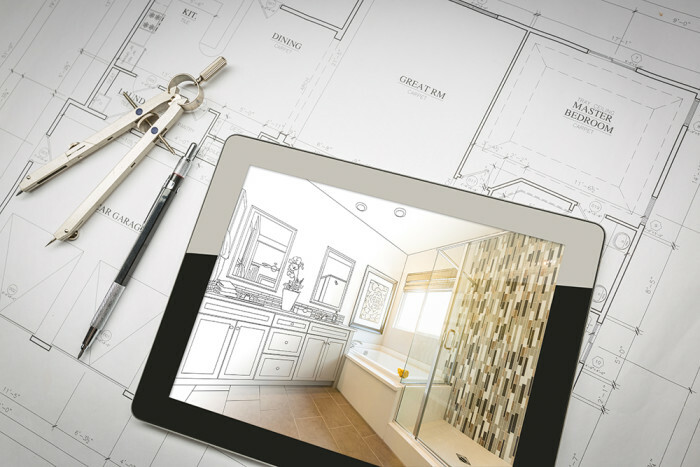 With the right planning and expectations, renovating your home can be less stressful than you think. Before you even begin with new ideas, take time at the onset to reflect on what’s propelling you to remodel in the first place. Do you you need more space? 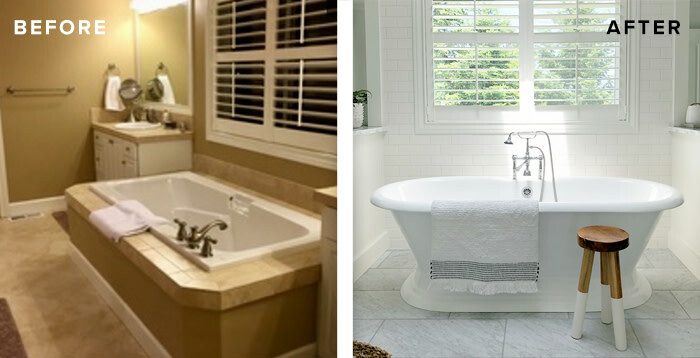 Are your kitchen or bathrooms outdated or not your "look?" Do you have enough storage? Do you need better lighting? Exploring why you want a change can help determine how you choose to tackle the solutions. Homeowner and designer Kristin Dion, has been slowly and methodically redesigning her home for the past nine years. 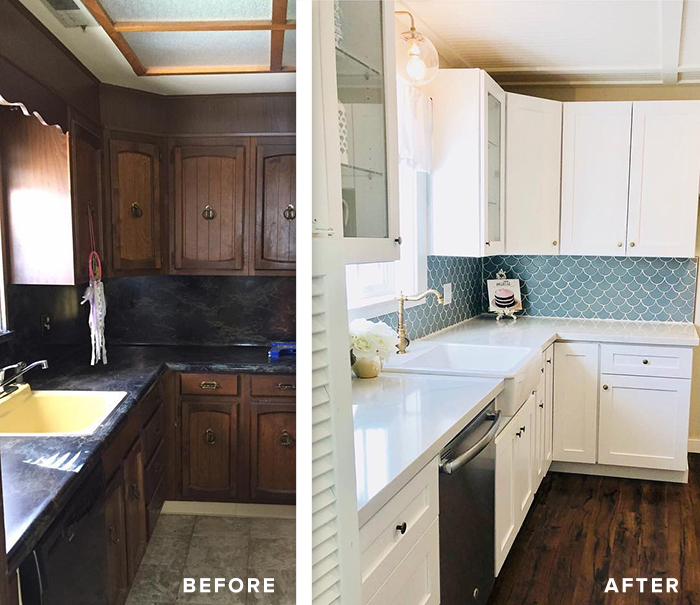 When it came time to revamp the master bath, her dilemma was the style of the room. She felt the space has good structure and layout, but needed a facelift to suit her personality and fit in with today's looks. "Our house is a Spanish style beach bungalow. 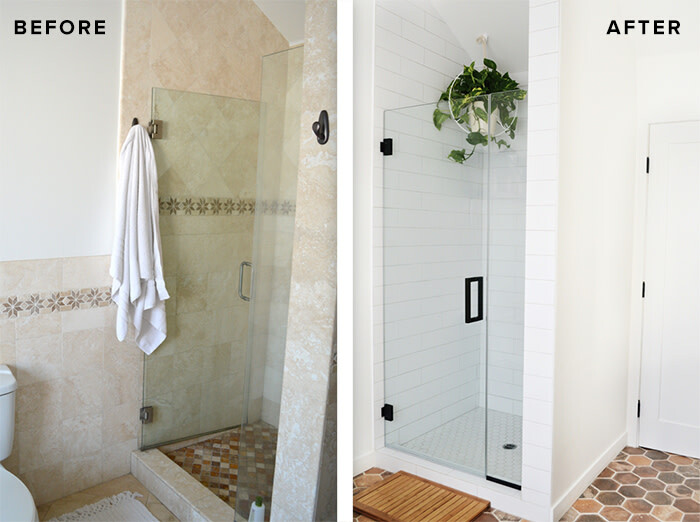 I wanted to keep the bathroom classic and consistent with the architecture of the house, while also appeasing my modern aesthetic and organic modern style (earthy natural tones with lots and lots of plants). 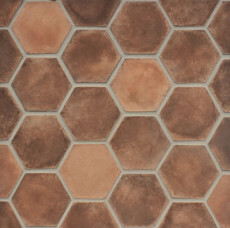 After spending hours and hours AND HOURS looking for inspo, I saw a kitchen picture with terra cotta floors. Once I got my heart set on that style, I found handcrafted concrete tile with more diversity and texture than terra cotta and I was sold. 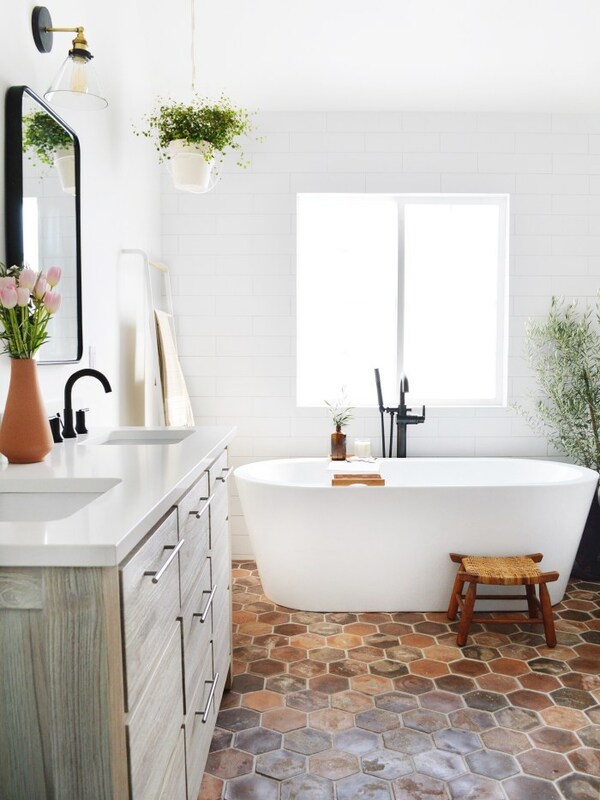 To complement the floors and appealing to my modern aesthetic, I chose white large subway tile, a wood vanity, lots of whites, plants and oil rubbed bronzed faucets to pop off the white," Kristin Dion wrote in her blog post on her master bath. 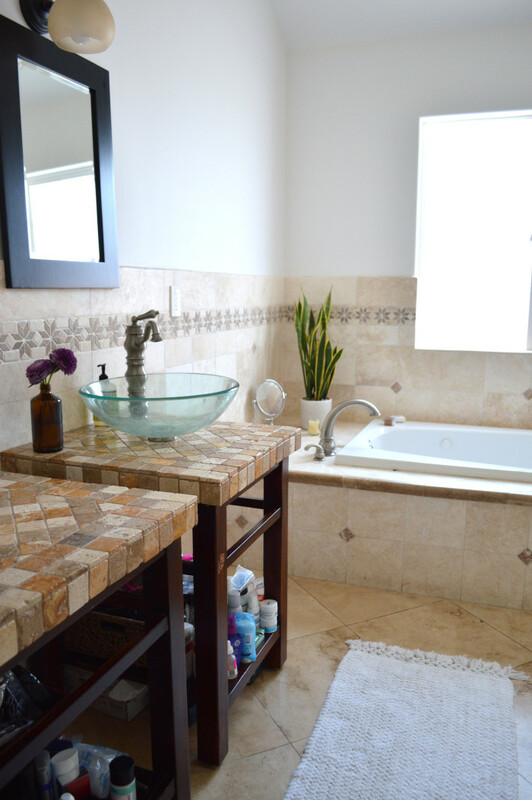 "The tons and tons of travertine were just not our style. And the vanities had NO storage at all, besides the one basket we could each fit on our vanity. The layout, however, was great," Kristin said. It Could Kill You. The first question you need to ask yourself about any DIY job is, what is the worst possible thing that could happen if you mess it up? For some jobs, such as roofing or major electrical work, the answer is, “I could get killed.” That answer is an obvious red flag – a warning sign that this is a job for a professional who’s trained to handle its dangers. It Could Destroy Your Home. Major plumbing or shower tiling jobs, fit into this category. If you don’t get everything properly installed or waterproofed, you can end up with a water leak – possibly one that goes unnoticed for years until it weakens a wall to the point of collapse. It's a Slab. Stone slabs are heavy and require a professional installer, called a fabricator. 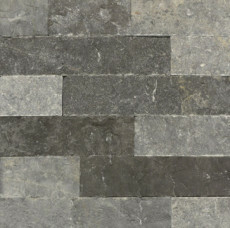 You will select your slabs with the help of Bedrosians associates and your chosen fabricator. To understand the slab selection process, review the Bedrosians Slab Buying Guide. What's the difference between a Slab Distributor and Slab Fabricator? 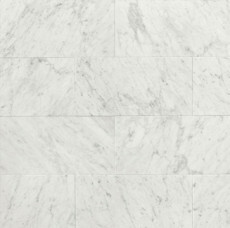 Distributors are basically the suppliers to the natural stone industry - Bedrosians Tile & Stone is a distributor. We provide access to the stone as well as technical support. We constantly curate a collection of top quality slabs for you to choose from. Fabricators are the hands-on stone experts who execute the process from templating to the final details of installation. This includes measuring, figuring out exactly how much stone, or other material, is needed, laying out the stone to ensure the best view of striations, veins, shading and other features of the surfacing product, executing edge details, and basically ensuring that your final product looks impeccably beautiful. At Bedrosians, we have a network of fabricators who we trust to work with the materials we sell. We’re confident that these fabricators will focus on quality and offer the best final results possible. Contact your local branch for a list of fabricators in your area. Mistakes Could Be Costly. 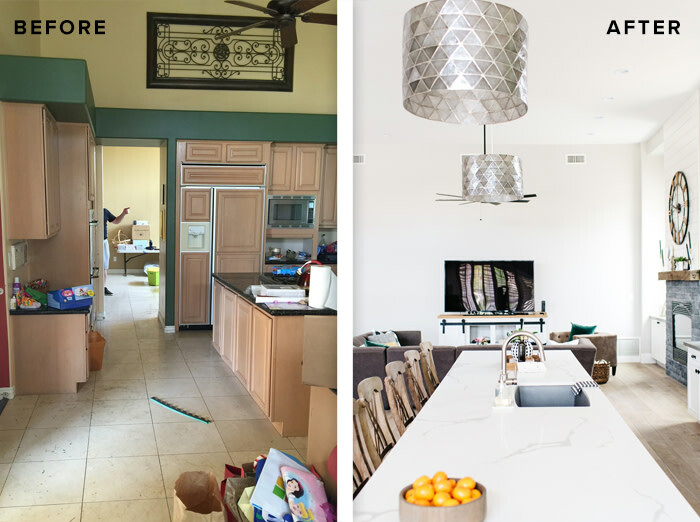 If you’re not quite sure what you’re doing when you tackle a job, you risk having to call in a contractor to fix your mistakes – so instead of saving money by doing it yourself, you could end up paying twice for the same job. It Could Hurt Your Home’s Value. Even the priciest bathroom tile looks cheap if it’s poorly laid. 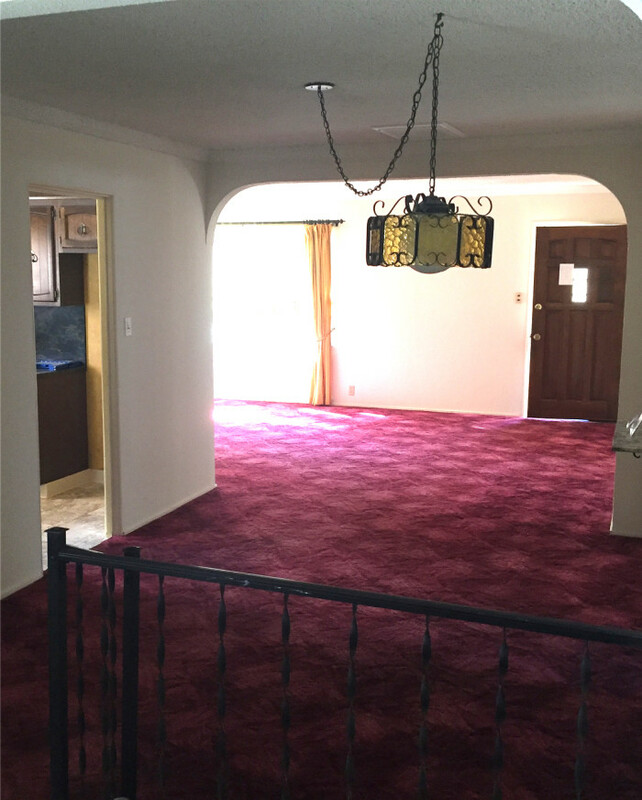 Only you know exactly how handy you are and if your completed job is going to be done artfully, as well as soundly. Each of our locations can provide a list of recommended tile setters and contractors to help you complete your project. Just ask an associate for more information. Price the Professional Job. Start by figuring out how much it would cost to have the job done professionally. Try using HomeAdvisor. Type in the name of the job you want done and your ZIP code, and the site displays a price range based on survey data from other homeowners in your area. Add Up the DIY Cost. Figure out how much it would cost to do the job yourself. Include the prices for materials, tools, and permits, if you need them. Add the expenses together to figure out the total amount it would cost to DIY. Then subtract this total from the cost of a professional job to determine how much you can save by doing it on your own. Estimate the Time Required. This is a lot harder to estimate than the cost, because the answer depends on your experience and skill level. However, home-repair books often give estimates of how long a job usually takes for novice, intermediate, and expert DIY-ers. You can also find time estimates for some DIY jobs on HouseLogic. COMPROMISE - CHOOSE A LITTLE OF BOTH. Most major home renovations require professional help for at least one project. You have to decide which projects fit that category for you. Below are some suggestions for dividing up those tasks. Do Your Own Demo and Cleanup. Even when you can’t DIY an entire job, you can often save money by doing parts of it yourself. Demolition is one example, since it doesn’t require a professional’s skill to swing a sledgehammer – just do so carefully. You can also save money at the other end of the project by doing all the cleanup and other finishing touches, such as painting. That way you only need to pay the contractor for the parts of the job that really have to be done by an expert. Get a Professional to Check Your Measurements. Nancy Soriano, former editor in chief of Country Living magazine says, "I can't emphasize enough how an inch or even sometimes a half an inch can make a difference. And if your dimensions are off and it's not equal and symmetrical, you're not going to get the full impact and effect that you want. If you're not sure about how to measure or you can't follow the directions, don't hesitate at all to call somebody. Ask them to come over and take the measurement for you.". 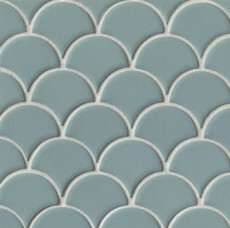 You can also read up on how to measure your space for tile in our blog post "Do You Measure Up?" 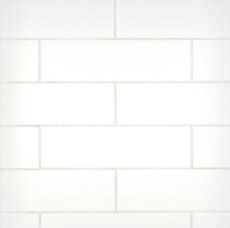 Tile the Backsplash Yourself. 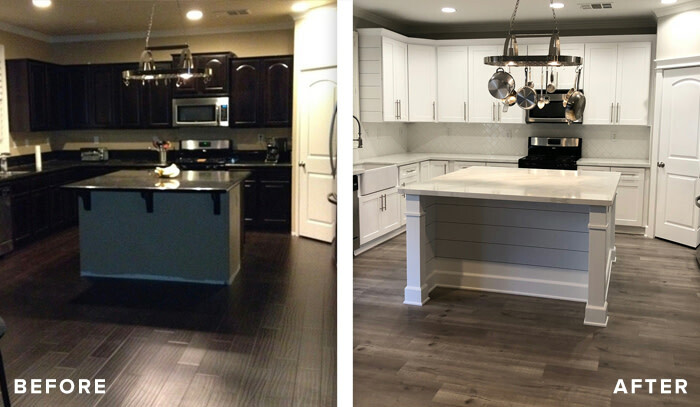 Once your slab countertop has been professionally fabricated and installed, you could complete your backsplash yourself (depending on its complexity). Watch this video to learn more about installing a backsplash.